Oh my Glob, now you can listen to your favorite music using your favorite heroes! It's flippin' awesome! 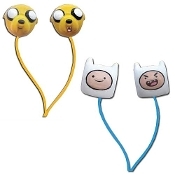 These Adventure Time with Finn and Jake ear buds are perfect! Perfect for the iPod, iPad, iTouch, Zune, plus many more devices.